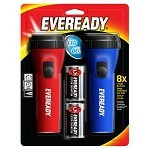 Eveready economy flashlights are a great general-purpose flashlight to keep on hand! Bright white LED runs up to eight times longer than the incandescent lights in standard flashlights. Lamp life is 40 hours. The LED's wide diameter illuminates a large area with 9 lumens. The ribbed textured along the casing creates a nonslip grip. Easily turn the flashlight on and off with the contour slide switch. 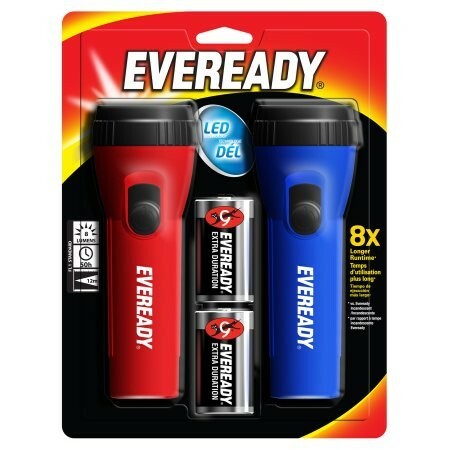 Each flashlight runs on one D alkaline battery and has a durable polypropylene casing!